In CAWI surveys you can set a progress bar (displayed on top of the CAWI interface) that allows the respondent to see the percentage of completion of the interview. You can decide whether to show or hide the progress bar according to the survey you are currently managing. 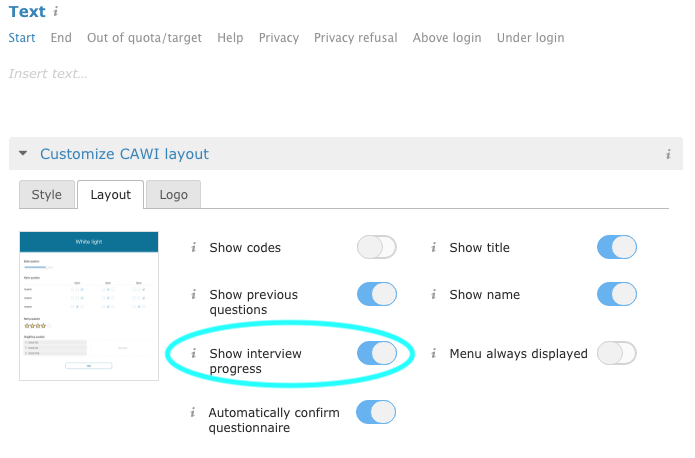 The option “Show interview progress” is enabled by default in any CAWI survey. In order to edit this function please follow the instructions. In order to display or hide the progress bar you have to enter the “Settings” section of the survey menu and then click on the CAWI tab. Clicking on “Layout” you can enable different functionalities including “Show interview progress”. By clicking on this button this will always be displayed on top of the CAWI interface.